As a young child, Jessica Jackley had a simple desire — to help those less fortunate than herself. She started as so many of us often do, donating money to various charitable organizations, but she always wished that there could be something more: something more powerful, something more intimate and direct, something that would create a personal connection instead of a just a one-time, one-sided transaction. That desire grew into a dream, and that dream turned into Kiva: the world’s first online micro-lending platform for the working poor. What started as an experiment ten years ago with just a handful of lenders and borrowers has since exploded into an international hub where people can lend as little as $25 to entrepreneurs in nearly 100 countries. Kiva loans top $700 million to date, the repayment rate is over 98.5%, and the platform has been heralded by headline makers such as Bill Clinton, Desmond Tutu and Oprah as a valuable giving resource. 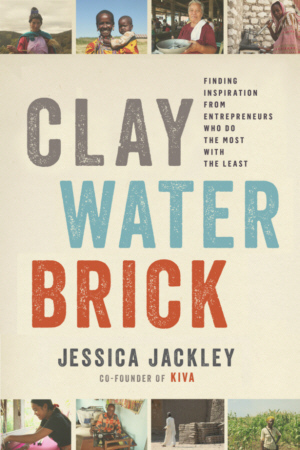 “Inspiring and insightful, Clay Water Brick is a book that you simply won’t be able to put down.